Christmas is coming up fast. With all the things you have to do for your church, keeping the buzz going on social media shouldn’t be one of them. We’ve got a free social media Advent calendar to help you. It’s 25 social graphics featuring Bible verses and a countdown to Christmas. Take advantage of the countdown and post one every day leading up to Christmas. Or if that’s too much, we included a set of graphics without the dates and countdowns, so you can just post your favorite verses whenever you need them. They’re available in square and landscape formats. Get our social media Advent calendar and check one more thing off your Christmas list. For more help, check out all our Courageous Storytellers Christmas resources for members (including a few freebies for non-members). Give yourself a gift and join Courageous Storytellers today. It’s a gift that keeps giving all year long with new resources every month and access to our ever-growing library of resources. 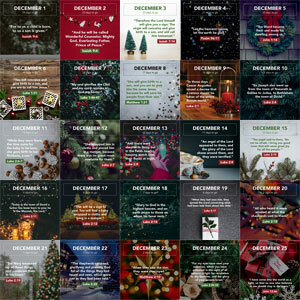 You can also take a break from the Christmas frenzy with our free 7-day Advent devotional.